Of all the Diaspora communities, the Jews of India are among the least known and most interesting. This readable study, full of vivid details of everyday life, looks in depth at the religious life of the Jewish community in Cochin, the Bene Israel from the remote Konkan coast near Bombay, and the Baghdadi Jews, who migrated to Indian port cities and flourished under the British Raj. Who Are the Jews of India? 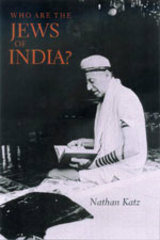 is the first integrated, comprehensive work available on all three of India's Jewish communities. Using an interdisciplinary approach, Nathan Katz brings together methods and insights from religious studies, ritual studies, anthropology, history, linguistics, and folklore, as he discusses the strategies each community developed to maintain its Jewish identity. Based on extensive fieldwork throughout India, as well as close reading of historical documents, this study provides a striking new understanding of the Jewish Diaspora and of Hindu civilization as a whole. Nathan Katz is Professor and Chair of Religious Studies at Florida International University, and the author of The Last Jews of Cochin: Jewish Identity in Hindu India (1993) and editor of Studies of Indian Jewish Identity (1995). "The last decade or so has seen a surprising amount of new publications on the Indian Jews. The awareness that the communities are disappearing has prompted memoirs by its elders as well as scholarly studies. Who Are the Jews of India? is the first book to present a readable, interesting, integrated treatment of the three distinct Indian Jewish communities that have evolved--the Cochin Jews, the Bene Israel, and the Baghdadis. It also brings together material on the Baghdadi communities of Bombay, Calcutta, and Southeast Asia in a way that I have never seen before. Its presence is most welcome; its scholarship is superior." —Daniel Gold, author of Comprehending the Guru: Toward a Grammar of Religious Perception and The Lord as Guru: Hindi Saints in North Indian Tradition.